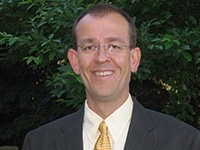 James (Jim) W. Hurrell is the Director of the National Center for Atmospheric Research (NCAR). He is also a Senior Scientist in the Climate and Global Dynamics Division (CGD). Jim received a Ph. D. (1990) in Atmospheric Science from Purdue University. He is the former Chief Scientist of Community Climate Projects in CGD, which includes the Community Earth System Model (CESM), and a former Director of CGD and the NCAR Earth System Laboratory. Jim also spent a year as a visiting scientist at the Hadley Centre for Climate Prediction and Research in the U.K.
Jim's research has centered on empirical and modeling studies and diagnostic analyses to better understand climate, climate variability and climate change. He has authored or co-authored around 100 peer-reviewed journal articles and book chapters, as well as dozens of other planning documents, workshop papers, and editorials. Jim has edited several books, and he has been acknowledged as a Highly Cited Researcher by Thomson-ISI (2004). Jim has given more than 150 professional invited and keynote talks, as well as many other contributed presentations at national and international conferences. Jim has convened around two-dozen national and international workshops, and he has served several national and international science-planning efforts. Jim has been extensively involved in the World Climate Research Programme (WCRP) on Climate Variability and Predictability (CLIVAR), including roles as co-chair of the Scientific Steering Group (SSG) of both U.S. and International CLIVAR, Chair of the Scientific Organizing Committee for the WCRP Open Science Conference (2011), and membership on several other CLIVAR panels. He has also served the International Geosphere-Biosphere Programme (IGBP) as a member of the Global Ocean Ecosystem Dynamics (GLOBEC) SSG and the CLIVAR-PAGES (Past Global Changes) working group. Jim has been involved in assessment activities of the Intergovernmental Panel on Climate Change (IPCC) and the U.S. Climate Change Science Program (CCSP). He has served on several National Research Council (NRC) panels, and he has provided briefings and testimonies to both the U.S. Senate and the House of Representatives on climate change science. Jim was elected to and served on the Council of the American Meteorological Society (AMS). He is a Fellow of the Royal Meteorological Society (2000), the AMS (2006), and the American Geophysical Union (2010). Jim is a recipient of the AMS's prestigious Clarence Leroy Meisinger Award (2001), the NCAR Outstanding Publication Award (1997), the Outstanding Alumnus Award from the Earth and Atmospheric Science Departments at both the University of Indianapolis (2001) and Purdue University (2004), and the Distinguished Alumnus Award from the Purdue College of Science (2006). In 2011, Jim was honored for his contributions to climate science by giving the Fridtjof Nansen Memorial Lecture to the Norwegian Academy of Science and Letters, where he was also awarded the Nansen Medal.